Hapag-Lloyd Cruises’ flagship, MS Europa, rated by Berlitz as the world’s only 5-star plus cruise ship, is offering guests the perfect winter getaway between beautiful Mexico and the Hawaiian Islands in January 2012, with a special upgrade offer. Guests booking a category 0 suite on this cruise, at £3,600 per person, will be automatically upgraded to a category 4 Veranda Suite, a savings of £1,930 per person or £3,860 in all. The cruise features Mexico’s endless beaches and Hawaii’s breathtakingly beautiful volcanic islands rising from the Pacific, capturing the eye with steaming craters, gushing waterfalls and lush green all along the islands. Passengers board the Europa in Acapulco on January 4, and disembark in San Francisco on January 20, 2012. The 16-day itinerary includes Acapulco, Zihuatenejo, Manzanillo, Puerto Vallarta, Cabo San Lucas, Kailua (Hawaii), Lahaina (Maui), Nawiliwili (Kauai0, and Honolulu (Oahu). Optional shore excursions include a stop at the UNESCO World Natural Heritage Site Volcanoes National Park on the Big Island of Hawaii, helicopter flights over Waimea Canyon, as well as Maui and Molokai, and an exciting boat trip to the tortoise sanctuary in Mexico. The Europa is the world’s first “all-suite” ship, with staterooms that are never less than 290 sq ft, 80% having their own veranda assuring privacy and relaxation. She offers guests the most space per passenger, as well as one of the highest staff passenger ratios, with 280 staff members for a maximum of 408 guests. New to the Europa since September 2010, Dieter Mueller became the first award-winning chef to open his own gourmet restaurant onboard the Europa. He is personally on board 70 days a year. Also, launched last month, the Europa’s “Baby Welcome Package” offers baby care products and baby food for passengers travelling with infants. 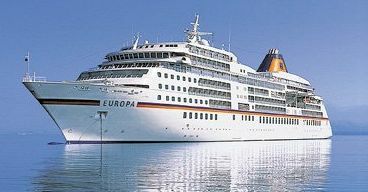 The Europa will visit over 20 countries in 2012 on her international (bilingual English and German) itineraries.